March 13th, 2013 - The highly-successful Kong Off Wildcard Rematch tournament will be getting a sequel this weekend—a "rematch of the rematch" where reigning champion Ross Benziger will defend his title against a now-open field of competitors. 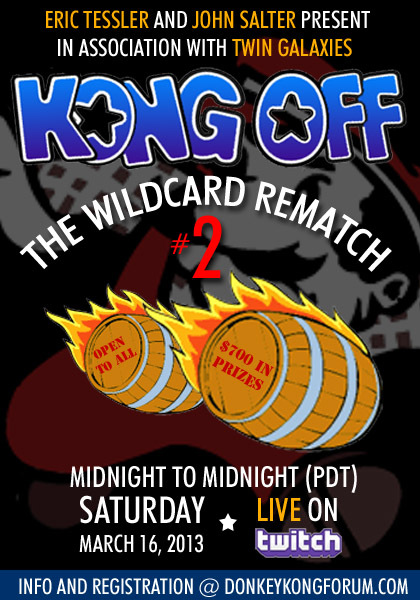 The first tournament, held in January, was limited to those who competed in the wildcard bracket at The Kong Off 2 in Denver last November. This time, organizers Eric Tessler and John Salter have extended the invitation to anyone who can stream their Donkey Kong gameplay to a Twitch.tv or Justin.tv account, either from an arcade machine or the MAME emulator, with only one stipulation: players with an officially-verified score of 1 million points or more may not participate. As of Wednesday March 13th, 30 players have registered, meaning that the majority of the Twitch.tv Donkey Kong streaming community will be on hand. If you're reading this post, and your name doesn't appear among Twin Galaxies' top 10 Donkey Kong scores, YOU may register as well! For complete details, and to find out how to enter, please visit the brand new Donkey Kong Forum and peruse the official tournament rules thread. I will recap the tournament when it concludes, and will myself be participating at http://www.twitch.tv/chrisp_kreme. My (tentative) plan is to start at midnight, play for five to six hours, then return in the afternoon to play out the rest. I invite you to stop by and say hello. I wish all of my opponents the very worst of luck. I'll need it. Nice write up as always Chris, nice work on the graphic too.